It just doesn't get much easier! 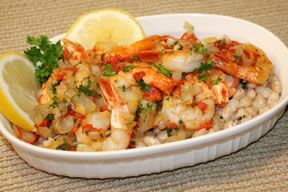 Shrimp plus McCormick® Scampi Seafood Sauce makes great tasting scampi in less than 15 minutes. 1. Heat Seafood Sauce in large skillet on medium heat. Add shrimp; cook and stir 4 minutes or until shrimp turn pink. 2. Serve over cooked rice or pasta, if desired.